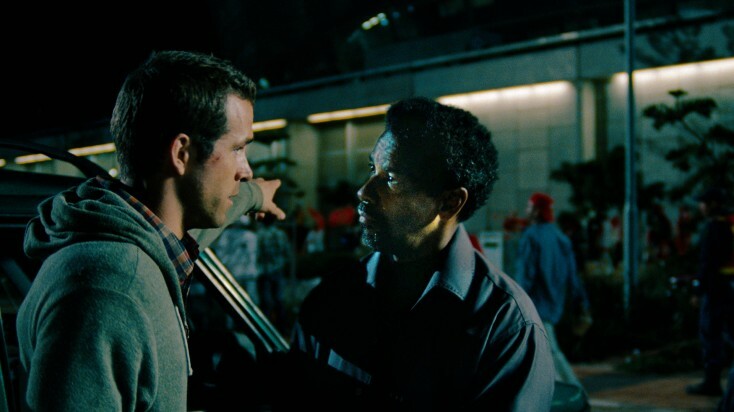 (L to R) Rookie operative Matt Weston (RYAN REYNOLDS) tries to outwit legendary spy Tobin Frost (DENZEL WASHINGTON) in the action-thriller "SAFE HOUSE." ©UNIVERSAL STUDIOS. (Click on photo for hi-res version). NEW YORK—Ryan Reynolds is dog-tired. The in-demand actor has been up until 4 a.m. wrapping his newest film, “R.I.P.D.” Yet he has a full day of interviews ahead for the crime drama “Safe House,” in which he plays a fledgling CIA agent who comes face to face with a fugitive traitor while on a routine assignment in South Africa. The 35-year-old Canadian couldn’t resist the opportunity to work with Oscar-winner Denzel Washington (who plays the rogue agent) and up-and-coming Swedish director Daniel Espinosa. Front Row Features: Has it ever happened in your own life where you’ve really worked hard for something, and then you’re smack in the middle of something unexpected that you have no control over? Ryan Reynolds: Yeah. Lots of times. You want to start with this morning? Yeah, of course. But the greatest lesson I’ve learned in life is: who knows what’s good or bad. Things come along that you really want, and then they turn out to be the worst thing in the world, and some of the worst tragedies that you could conceive of that can happen to you turn into the best things—like the exact medicine you need at that moment. So I’ve learned to have a bit of faith, in my cynical way. It’s softened me in all the right ways. Front Row Features: What was it like working with Denzel? Reynolds: One of the reasons I wanted to do the film was a chance to be working with the greatest actor working in Hollywood today. That was a huge impetus for me. I also just loved the idea that my character is this guy who is slowly disillusioned with everything he believes in. It’s the slow disintegration of God and country for him. Those values mean everything to this guy, and to watch that get peeled away slowly by Denzel’s character was just remarkable. What we don’t know is more terrifying than what we do know. So much goes on behind the scenes that we’ll never know about. I liked investigating that world. Front Row Features: And your director, Daniel Espinosa, what did you make of him? Reynolds: He is just a truly incredibly gifted filmmaker. He’s just so insightful. He almost acts like a bit of a thug, but he’s also read every book you can pretty much imagine, and he’s seen every film you can imagine. And he’s learned from the best. And that’s applied every day to what he does. It really is a craft for him. Front Row Features: Is it true you gave Denzel a black eye while making the movie? Reynolds: I did, and that was my early retirement; time for me to go home. (He laughs.) That first look he gave me after it happened was definitely real. It was weird to feel my face on fire. But I’m glad I was his first. If it was going be anybody, I’m glad it was an apologetic Canadian. Front Row Features: Your fights were pretty intense. How did you pull that off? Reynolds: The trainers. Those guys are really great at making it look real ugly. That knife fight in the phone booth kind of feel—that’s what you want. But we had a couple of rounds that we went, in which I had to practically wear an adult diaper before I got it on with Denzel. Hey, I’ve seen “The Hurricane.” Great. I gotta fight him? Terrific. Front Row Features: How did you feel about the scene where Denzel is getting water boarded? Reynolds: That was the most disturbing thing I think I’ve ever seen. Watching him being water boarded was really indescribable. Front Row Features: With a movie like “Safe House” about the CIA in peril, do you worry about our national security? Reynolds: It’s a Disney movie, isn’t it? No, I just think it’s not what we know that’s terrifying. That’s pervasive with everything in life, really. But yeah, I’m sure a book or two could be written about what really goes on there. Front Row Features: Did you learn any secrets from the CIA agent consultant in order to play one? Reynolds: Yeah. He was on the set most of the time. Front Row Features: Were you really driving that speeding car in all those dangerous scenes? Reynolds: Yeah. I did lots of it. What’s actually odd about the sequences driving the car is that it’s actually much less terrifying for me. We had a pilot guy that’s on top of the car for some of those scenes, and he would have those cars on two wheels. Daniel (Espinosa) would be sitting in the wheel well beside me giggling like a little schoolgirl while the car goes up on two wheels. He’s yelling, “faster, faster, faster.” He can’t see anything. Then, I find out later Daniel has never driven a car before in his life. He doesn’t drive. So being in that position was crazy. We would be going headlong into a brick wall, and I would hit the brakes, and the guy on top would hit the gas, so that was a very strange feeling. I’ve never been in a situation like that. And I’ve never seen a rig like that for a car. But it’s a professional driver on top, and he just knows the weight of the car. At least, that’s what you’d like to believe when he’s doing it. But that stuff was pretty intense. Front Row Features: What were the slums like where you filmed in South Africa? Reynolds: Huge, but just teeming with joy. The people there are incredibly happy, given the horrendous circumstances with which they’re living. If you’re from the United States and you go over there, you can’t really believe what you’re seeing, but you can get DirecTV. You can get “Everybody Loves Raymond.” I was surprised. Front Row Features: What can you say about your upcoming movie, “R.I.P.D.,” that you just finished last night? Reynolds: That’s a movie that I’ve been with for years and believed in. Just to be standing on that set was an incredible feeling. It’s just being passionate about something, and sticking with it. That’s really half the battle, showing other people why it is that you believe in something.